Siwash Lake Ranch. 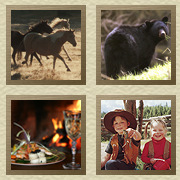 BC Guest Ranch Western Vacations, Horseback Riding, Fly Fishing for Rainbow Trout, Hiking & Mountain Biking. 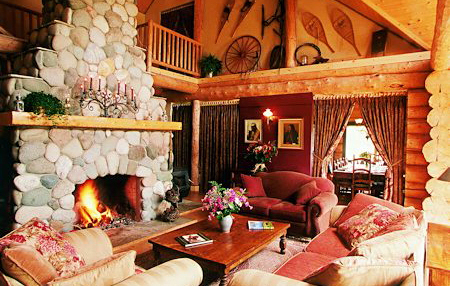 A private and exclusive guest ranch hidden away in Cariboo Country, British Columbia, Canada. Here, you can savor freedom, fresh air and wide open spaces. Horseback riding is the highlight of a ranch holiday and we have a beautiful, well-loved and well-trained herd available to suit your experience, whether you're trying horseback riding for the first time or are a seasoned horseman or woman. Ride on your own or with a private guide. The Cariboo region's rivers, lakes and streams provide spawning, rearing and foraging habitat for wild native fish, including BC's legendary rainbow trout. Cast your fly to a rising rainbow trout! Prolific fly hatches, a nutrient rich environment and clear, cold waters make this area a fantastic fishing destination. Hike to our favourite mountain lookout, or hike a river canyon to cascading waterfalls. Mountain bike an array of backcountry trails. The riding trails double as hiking and biking trails, and routes of varying duration and challenge are available – everything from an all-day hike to an hour’s fitness loop around the ranch property. 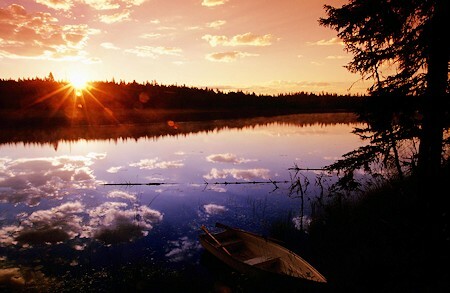 Then, paddle a canoe across shimmering Siwash Lake. Enjoy the very best in off-grid, luxury holidays in the Canadian wilderness. Our eco-friendly, boutique lodge is built with hand-hewn spruce logs and is set at the edge of a meadow on a knoll overlooking Siwash Lake. A lovely southern exposure is perfect for the solar panel array that’s used to power the place. French doors open to a spacious deck, where you can share your day's riding adventures over drinks and appetizers while wild birds serenade from the nearby pines. Or you can retreat to one of several verandahs, to steep quietly in the gentle ebb and flow of the great outdoors. 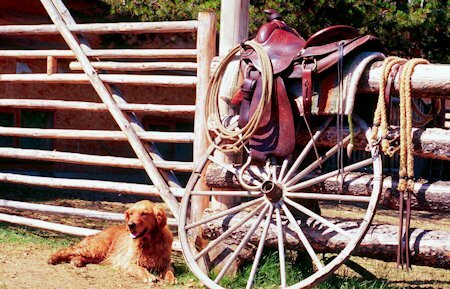 The ranch has a variety of guest accommodation with beautiful lake and BC wilderness views for you to choose from. 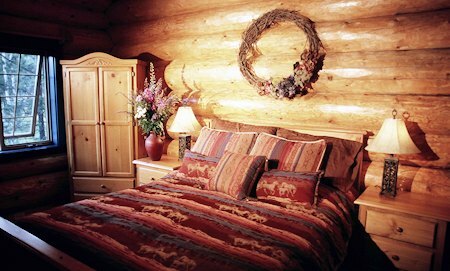 Each suite is distinctively different and all are in harmony with the best of wilderness living. Most rooms have a queen or king size bed, French doors leading onto a private balcony or a sitting area with glass-fronted wood-burning stove, and a luxurious en-suite bathroom with shower and soaker tub. Family suites have a queen or king bed and two single beds. At mealtimes, you'll be delighted with delicious cuisine and great fellowship in our cozy 20-seat main dining room. Hand-hewn log walls, a rich fir plank floor, casually elegant furniture and candle light combine for a wonderfully warm dining ambience. Tables vary from large group and family size, to intimate window settings for two that overlook wild bird feeders and horse pasture. This boutique wilderness lodge features a soul-pleasing blend of the rustic and the refined. 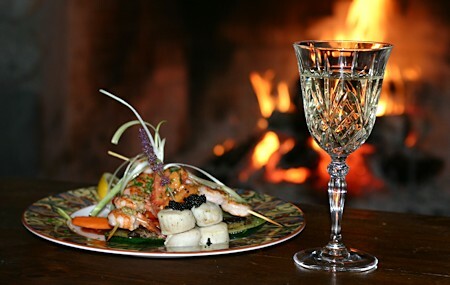 Ultra-luxurious accommodations, fine dining and warm, gracious hospitality combine with genuine adventure and a maximum capacity of 12 - the ultimate guest ranch experience. 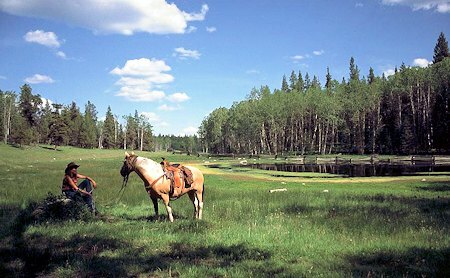 "Rated among Forbes Traveler's Top Ten Luxury Dude Ranches & Canada's most eco-friendly luxury destination by the Globe & Mail."